Liberty and discipline sound like such heavy, important topics. When I think of Montessori my mind always goes to the beautiful materials. But the basis, the foundation of it all, is the balance of liberty with discipline. My sister now has her daughter, who is almost 3, in a Montessori class. She's heard me talk about Montessori for years, so she had a pretty good idea going in what it was going to be about. But I don't know if she had ever really seen a Montessori class up close. After her first visit to her daughter's new school, she called me and said, "I understand now about how they can have so much freedom. It's okay to let them make their own choices if every choice is a good one." So many people think that in Montessori education, children can just run wild. Unfortunately, there probably have been some classrooms where that happens on a regular basis. The key is to control the environment. If, as my sister said, every available choice is a good one, it will be much easier for the child to make good decisions. Still, there is always room for disobedience. We may call it "non-peaceful behavior" because that sounds a little nicer, but the truth is that many children have difficulty handling the freedom that comes with the world of Montessori. This is where observation becomes so important. Each child may differ in their ability to make correct choices. Some may need rules or controls that another child doesn't. Others may repeatedly test guidelines that their peers leave alone. There are many different ways to balance liberty and discipline. Establishing clear guidelines (perhaps in the form of ground rules) is a great first step. Children become frustrated when they don't know what the expectations are for their behavior. When a child is born, they are initially completely cared for by their parents. They have no freedoms, no responsibility. The goal for this baby - far off in the distance - is for them to become a mature, independent adult. How do you go from one point to the other? The key is to increase their liberty - freedom - gradually over time. Baby steps, as it were. A six-year-old can handle a certain amount of freedom; a 10-year-old can handle quite a bit more. The important thing is that the 10-year-old was given some freedom as a 6-year-old, 7-year-old, eight-year-old, etc. so that by the time they are 10, they can handle making good choices. It's different for each child. As many of you have seen, in my elementary training I was taught to use workplans for the children. That's a control for them, in terms of helping them make good choices and keep track of their work. But sometimes even the workplan was too much for a child to handle. In that case, rather than a monthly workplan, we gave the child a daily workplan with several choices - some made by the teacher, some made by the student. A few weeks of using this method and the student was usually ready to move to a monthly workplan. The key was to observe where the student was at and how much freedom they could handle. A second "must" to balance liberty and discipline is to keep the consequences of misbehavior consistent. I've found that letting the child choose the consequences, before the misbehavior takes place, is extremely effective. They will often choose something even more severe than the teacher or parent would have chosen. The key is to enforce the consequence consistently, and to try to have the consequence be a logical result of the child's behavior. This quote from Maria Montessori is especially helpful: "It is clear therefore that the discipline which reveals itself in the Montessori class is something which comes more from within than without. But this self-discipline has not come into existence in a day, or a week, or even a month. It is the result of a long inner growth, an achievement won through months of training." (The Absorbent Mind). It helps enormously to keep in mind that the process of balancing liberty with discipline is a long one. It's not something that is perfected in a day, a week, or a month. Seeing the long-term goal puts into focus the day-to-day choices; just as we as adults are continually growing and changing, still even more are children a work in progress. Another important concept to keep in mind is balance. A child can be just as hurt by over-permissiveness as by excessive strictness. With my own children, I have a sense (if I am really paying attention) of the time when I move from loving, wise boundaries to being overly strict. I try to say "yes" as often as possible, and even more so, make all their available choices good ones so that my "yes" isn't even needed. 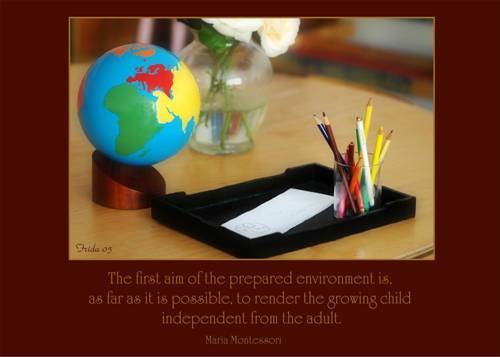 The end goal - that of a child who is a mature, independent adult - will be characterized by innate discipline. Most people will follow rules when being observed or graded. These external controls are often false, and disappear once you are left on your own. The true test of character is what a child does when left alone. When a child can make good choices when no one is looking, you can know that the combination of liberty and discipline is in perfect alignment. All content copyright Montessori for Everyone. All rights reserved.